This entry was posted on Friday, May 20th, 2016 at 4:00 am	and is filed under Asparagus, Breads, Muffins, and Scones, Breakfast and Brunch, Cakes, Pies, and Pastry, Rhubarb. You can follow any responses to this entry through the RSS 2.0 feed. You can leave a response, or trackback from your own site. Tinky, I’m going to try this this weekend after I hit the Farmer’s Market tomorrow (hopefully someone will be selling asparagus). I think I’ll use some Jarlsburg cheese (I have a left-over hunk in my fridge that I’ve been nibbling on.) I love blue cheese and just finished off some Danish blue I bought for a little gathering, but I think would have been a little too sharp for this dish anyway. I love that you forgot some ingredients, but soldiered on and adapted. Like Julia always said, act as though the outcome was exactly as you had planned all along! Or, expressed another way, never let them see you sweat! Oh, and one more thing, I recently purchased The Complete Vegetarian Cookbook by America’s Test Kitchen. It has a foolproof tart shell recipe that is never a problem to get into the pan! And it is delish. I made a tomato tart for my daughter and her husband when I was up in Maryland last week using it. Everyone loved it. That will definitely be my crust for this quiche. Grad, that sounds great! And if i make it again, I will definitely try something Swiss-ish instead of the blue, which is quite strong. You might also cut back on the garlic; I’m not sure it’s needed, although a little garlic never hurts! I am going to post this on my Facebook page. My mother just LOVED quiches. I got to taste them, and they were all delicious. I am sure this one is too. I am supremely lucky have some great quiche stoneware pots she made with great curvy sides. I need to use them. Thanks for another fun posting! 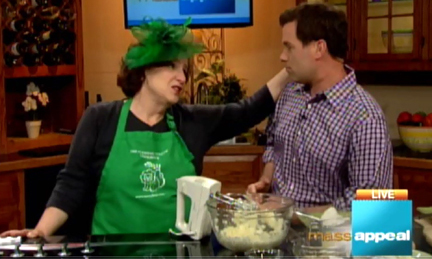 Ooh–I’d love to see those quiche dishes! And I’m happy to make you think of your mother….. I also rarely buy asparagus in the winter……. just at Christmas. It is my absolute favorite veggie!!! I get mine at the farm and buy what they call culls . They are really thin stalks about 1/4 inch thick, and have no tough end to snap off, but are every bit as tasty as the thicker pieces that most people prefer. I like to eat mine raw but do try new recipes when I happen to find someone else’s recipe. I made yours last night, and ate the whole thing myself….OINK<OINK. It was delicious!! I also make a lot of cream soup, using whipping cream. It is insanely decadent, but every three days I have the soup for breakfast , lunch, and dinner, and if any is left again before bed. It is the only veggie I eat this time of year. The season is so short I just can't get enough. The same thing happens in August when the corn comes in. I have to have corn on the cob every day, but I do have other food with it, But for the next 6 weeks it is only asparagus God surely came up with a winner when he made this most delectable green gift. Carolyn–You are my kind of eater! Enjoy the rest of this glorious asparagus season…. 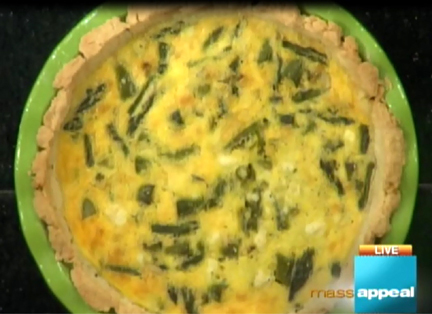 Tinky, I made the asparagus quiche recipe and it was wonderful! I did use the Jarlsbug I had left over, but next time I wii try it with blue cheese, which I love. I don’t think there was too much garlic, but I did roast it first. Love this recipe and will be making it again. Keep ‘Em coming. Roasting the garlic was inspired, Grad! So glad you ended up with yumminess…..